Happy Life Day! Here at Corellian Run Radio, we’d like to celebrate the holiday by holding a contest! 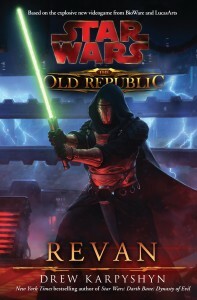 We will be giving away one paperback copy of the Star Wars: The Old Republic novel Revan, written by Drew Karpyshyn. To enter the contest, please submit a suggestion for a show topic or discussion via this link on Rafflecopter! We will be announcing the winners on our next show, which will be recorded next Sunday, December 21st. Even if you do not win, we will still consider all of the submissions for topics on the show!